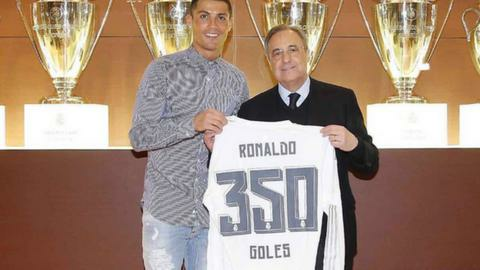 Cristiano Ronaldo clocked up another milestone as he passed 350 goals for Real Madrid with yet another hat-trick in his side's 7-1 romp over Celta Vigo. But he wasn't the only goalscorer in the news on a weekend when one unfortunate player took an embarrassing tumble. What else happened in Europe this weekend? Here are the stories you may have missed. It has not been a good season for football's stretcher-bearers, and a pair of clumsy medical assistants left an injured player fuming in Israel this weekend. In an incident similar to a similar mishap in Greece in October, the duo dumped Maccabi Ahi Nazareth's Moamen Saleh on the turf after losing their grip on the stretcher during a game at Maccabi Herzliya. Saleh went down holding his leg, prompting the pair of stretcher-bearers to sprint on in a bid to help. But, after one assistant had struggled to lift Saleh's weight, his colleague at the rear dumped the player on the floor and was left holding only the handles as the stretcher fell apart. It was all too much for Saleh's captain, who took matters into his own hands by carrying his team-mate to the touchline. Saleh did, at least, end up on the winning side as the visitors triumphed 1-0 in the second-tier game. Could Rennes youngster be the next big thing? France has been a rich source of talent for Europe's top leagues in recent years, and Ousmane Dembele is being tipped as the country's next big star. Leading clubs across the continent have already started taking notice of the 18-year-old Rennes winger, with Premier League leaders Leicester among those reported to have shown an interest. But his value is likely to soar after he netted a first-half hat-trick in a 4-1 win against Nantes. Dembele opened the scoring in the first minute and by half-time Rennes were 4-0 up with Kamil Grosicki also on the scoresheet. Adryan reduced the arrears for Nantes in the second half and Rennes were reduced to 10 men when Giovanni Sio was sent off. Chelsea fans are desperate to see more youngsters graduate from the Stamford Bridge academy, and one Blues teenager has finally made his mark in the Netherlands. Izzy Brown has struggled to get close to the Chelsea first team since angering West Brom by leaving as a 16-year-old in 2013 to move to the London club. Now aged 19, he was sent to Vitesse Arnhem on a season-long loan but injuries have limited his involvement for the Dutch side. That was until yesterday, when Brown opened the scoring in a 2-1 win at Roda, with his side scoring a 90th-minute winner. He controlled a long ball on his chest and turned smartly before scoring with an excellent shot. Chelsea have high hopes for the attacking midfielder, who was picked up by West Brom as a schoolboy from Histon and became the second youngest player in Premier League history when he played for the Baggies aged just 16 years and 117 days. Veteran striker Claudio Pizarro is already a legend at Werder Bremen and is now just one goal away from writing himself into the club's record books. The 37-year-old is in his fourth spell with the Bundesliga side, including a loan stint from Chelsea in the 2008-09 season. The most prolific foreign goalscorer in Bundesliga history, Pizarro became the oldest player to score a hat-trick in the German league in a midweek 4-1 win at Bayer Leverkusen. And on Saturday, the Peru international, who returned to the Weserstadion from Bayern Munich last summer, notched with another spectacular effort as Werder Bremen beat relegation rivals Hannover 4-1 to continue their recent revival. 'Pizza' now has 12 goals in his last 11 games and needs just one more to equal the club record total of 101 scored by former Germany international Marco Bode, who helped Bremen win the Bundesliga title in 1993. Getafe finally ended a seven-match losing streak in La Liga thanks to a 1-1 draw at Seville. And their late equaliser also brought to an end an unwanted record for the club's longest goalless run in La Liga. Getafe hadn't scored in their previous six games and the drought had stretched to 642 minutes before Emiliano Velazquez equalised four minutes from the end.